Introduction: Recent guidelines from the American Cancer Society recommend to start screening for colorectal cancer (CRC) at 45 years of age in individuals with average risk. Majority of the colorectal carcinomas arise from the adenoma-carcinoma sequence. Despite these new recommendations, there continues to be paucity of data regarding prevalence of adenomas in the younger population. We sought to evaluate the predictors of increased prevalence of adenomas in 40 to 49-year-old individuals undergoing colonoscopy. Methods: A retrospective cross sectional study was performed using our electronic endoscopy database. Study subjects included all 40 to 49-year-old patients undergoing their first colonoscopy at our tertiary care academic institution from January 1, 2010 to September 30, 2017. Exclusion criteria included patients who underwent colonoscopy for overt gastrointestinal bleeding, inflammatory bowel disease, a history of familial adenomatous polyposis, hereditary non polyposis CRC. Data collected included baseline characteristics, findings during colonoscopy, colonoscopy quality indicators, and histology of the polyps. Univariate analysis and multivariate analysis was performed to identify factors associated with high adenoma detection rate (ADR). Results: A total of 2059 patients were included in the study. Out of these, 355 patients had family history (FH) of CRC and/or advanced adenomas (AA), while 1704 patients had no FH of CRC or AA. Mean age of these patients was 44.7 years, and 59.8% were males. 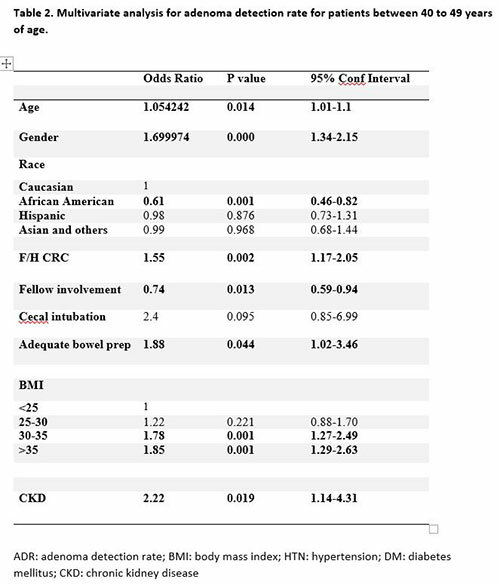 On a univariate analysis, male gender, older age, adequate prep, high BMI, and chronic kidney disease (CKD) were associated with high ADR (Table 1). On a multivariate analysis while adjusting for possible confounding factors; male gender (OR: 1.6, 95% CI: 1.3-2.1, p (OR: 1.7, 95% CI: 1.2 – 2.4, p=0.001), CKD (OR: 2.2, 95% CI: 1.2-2.4, p=0.019), FH of CRC (OR: 1.5, 95% CI: 1.1-2.0, P=0.002) and age (OR: 1.05, 95% CI: 1.01 – 1.1, P=0.014) were associated with high ADR. 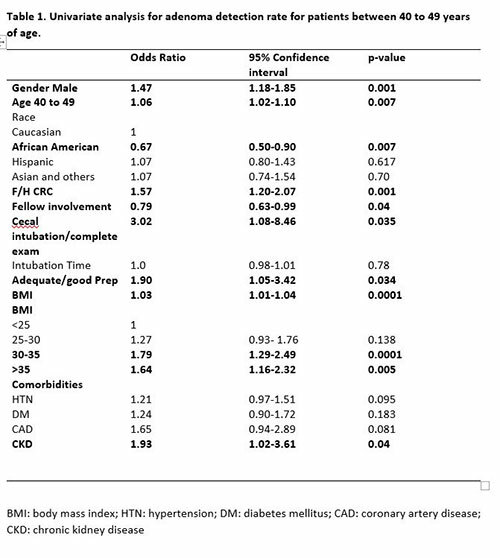 Discussion: Our study shows that in addition to FH of CRC, age, male gender, BMI, and CKD are independent predictors of increased ADR in patients between 40 to 49 years of age. Our study suggests that rather than performing early colonoscopy on everyone, select group of individuals (obese males with CKD) might benefit from early institution of CRC screening. Further large multi-center prospective studies are needed to validate these finding. Mohammad Bilal indicated no relevant financial relationships. Yamam Al-Saadi indicated no relevant financial relationships. Thanh-Truc Le indicated no relevant financial relationships. Shailendra Singh indicated no relevant financial relationships. Praveen Guturu indicated no relevant financial relationships. Citation: Mohammad Bilal, MD; Yamam I. Al-Saadi, MD; Thanh-Truc Le, MD; Shailendra Singh, MD; Praveen Guturu, MD, FACG. DOES EVERYONE NEED EARLY COLONOSCOPY? SELECT GROUP OF PATIENTS MIGHT BENEFIT FROM EARLY SCREENING FOR COLORECTAL CANCER - AN UPDATE. Program No. P0111. ACG 2018 Annual Scientific Meeting Abstracts. Philadelphia, Pennsylvania: American College of Gastroenterology.